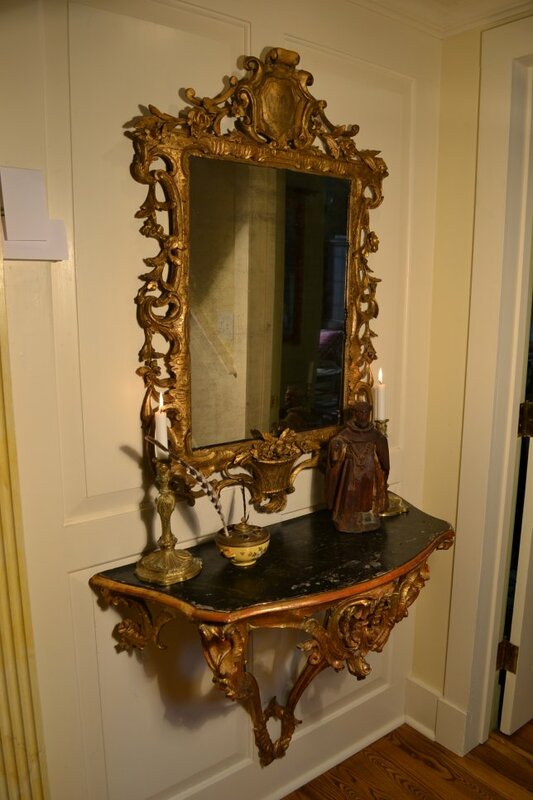 George II pier mirror, measuring 43″ tall by 29 ” in width, it is sure to impress your discriminating guests. You will understand when I say that these are hard to find! The cresting includes an armorial crest within scrolling tendrils. One can imagine that it may have held an image of a family armorial, at an earlier time. Lively pierced leafage, flowers, and scrolling continue to a bold apron with a central basket of flowers. This prominent placement of flowers can be read as the attribute of the goddess Pomona and of taste, with additional connotations of charity. Old mirror glass and backboards are still intact.